It seems like HTC is gearing up to introduce its new flagship HTC 11 soon. Their last flagship device HTC 10 was a good device but didn’t do very well in the market. The major factor for such response was that HTC 10 didn’t have anything which made it to stand out from the crowd of flagship smartphones. 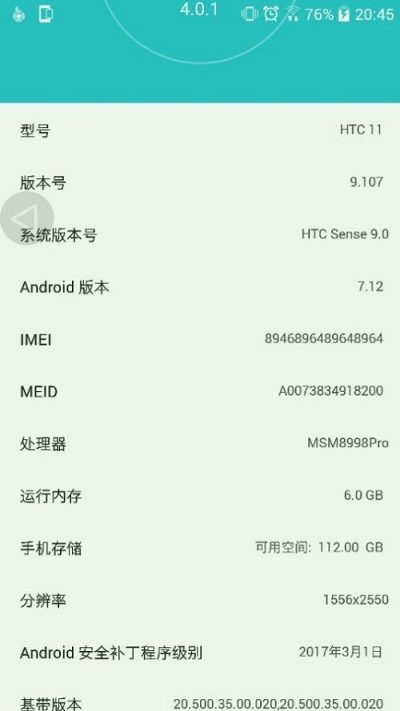 Recently a screenshot leaked which revealed some basic specification of the upcoming smartphone HTC 11. However there is no official word on this so we aren’t really sure if this going to be same while the official launch. HTC 11 will be running on the high end Soc from Qualcomm that is Snapdragon 835 with an octa-core processor. It will be paired with 6GB of RAM which should be more than enough for any day to day task or even for heavy tasks. On the storage front it will be having 128GB of on-board memory out of which 112 GB is available for the user. The screenshot also reveals that HTC 11 will be running on the latest Android 7.0 Nougat update with the upcoming HTC Sense 9.0 custom UI on top. Google just released Android 7.1.2 Nougat beta update for Nexus and Pixel devices. The HTC 11 will be having a weird resolution that is 1556 x 2550 pixels. This one is close to Quad HD resolution but not the same which indicates that the display may be a curved display. Since these all specificationa are just a leak we can’t really confirm that if these specs will be same in the official device too. However the screen resolution of this device is really odd which makes the device interesting. Not to mention that Samsung and LG will also be launching their flagship smartphones in the upcoming months.